and we have to create an XML document using the XSD file and the data. 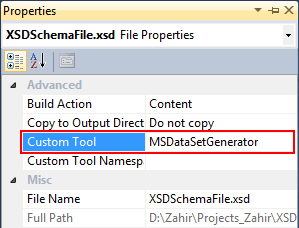 As we want to create an XML out of the XSD, the best approach will be to get a DataSet with the structure in XSD file, then assign the data that we have to the DataSet and generate the XML using the DataSet. 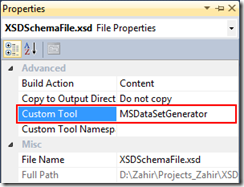 Microsoft provides 2 ways using which we can get a Typed DataSet from an XSD file and use it further in our code. XSD.exe can used to generate the CLR classes for XSD files. It is part of .Net Framework SDK and can be found under InstallationPath\Microsoft.NET\SDK\v2.0 64bit\Bin. Use the command below to generate a CS file for the XSD in our example. We can check the auto-generated code and start using the class in our application. If you notice the class generated is derived from System.Data.DataSet. Now lets start using the Typed DataSet in our application, assign it the data and generate the XML file. Hope this helps. Feel free to drop a comment.